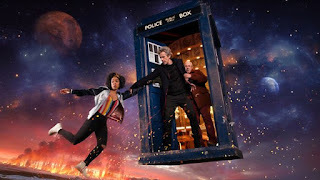 The new series trailer got its first airing in the middle of the FA Cup match last night and features Peter Capaldi as The Doctor, with Pearl Mackie as his (annoying) new companion Bill Potts (does she really call the TARDIS a "kitchen"?!) and Matt Lucas as (surprisingly not as annoying as Bill's going to be and that's saying something) Nardole, as well as a selection of monsters (some new some not), robots ("it speaks emoji!") and locations (Mars, 1814, the vacuum of deep space etc). Doctor Who returns to BBC One on Saturday 15 April with episode one, The Pilot. Watch the teaser below and let us know your thoughts.